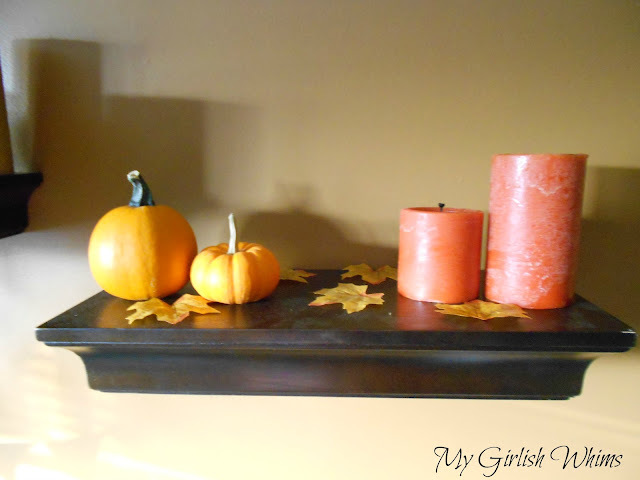 I have been so excited to decorate for fall this year!!! Thus, I kicked our rears-in-gear to finally do something with the big open wall space in our family room. I bought three different sized floating shelves from home depot to fill the space. Side note: I originally bought floating shelves in a similar size/style from Target. DO NOT BUY THOSE SHELVES! The first one we put on the wall literally broke right oftf. They were very cheap quality! I love me some target....but for a floating shelf, get something with a little better quality! 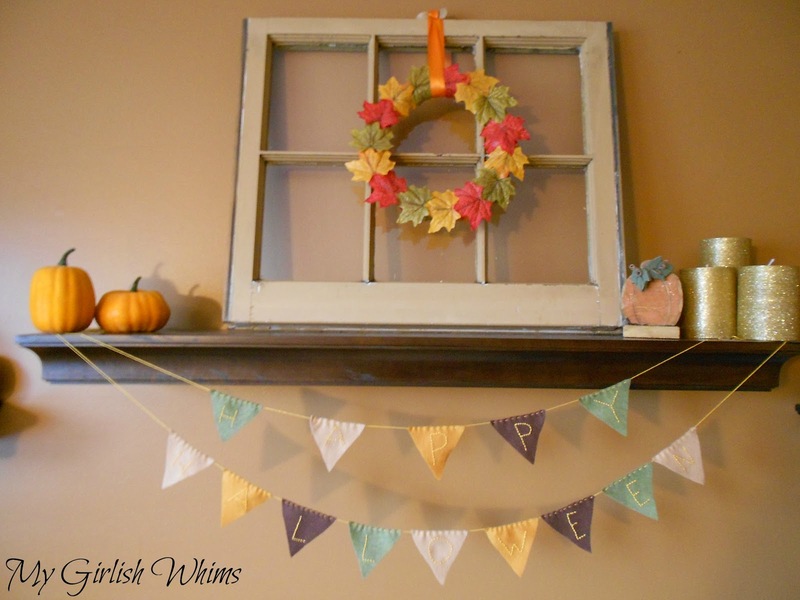 I made the fall leaf wreath with dollar store supplies. The two little pumpkins on the left are from the dollar store. The right pumpkin I got as a gift from my RA senior year, and the three glitter candles I got on sale from Michaels. (I love how they put all their fall decor on sale in the beginning of October still!!!) The window pane I got from a local shop, and the Happy Halloween bunting I made last year. Love this little banner! I'm already planning a Thanksgiving one so I can just swap them out after the 31st! 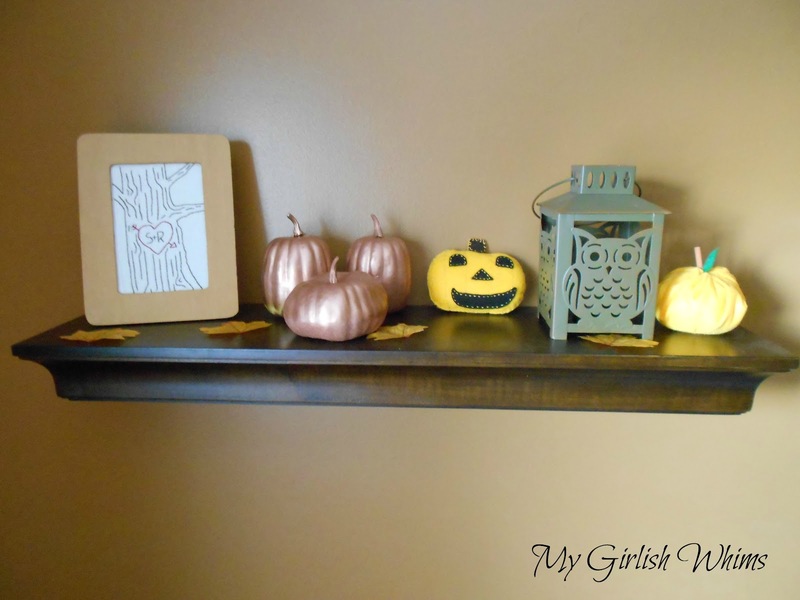 The last shelf has (from left to right) my Tree Embroidery, three pumpkins from the dollar store that I spray painted copper, my felt jack-o-lantern I made last year, an adorable owl lantern I got for $2.50 at target, and my simple felt pumpkin. These little decorations just make my heart so happy for the season :) I don't have a mantel to decorate, but these will do just fine for me!! The bunting is so cute! I thought about making one for my entryway. How big are the individual letters? cute banner! Your shelf looks great! Your shelves look fantastic - very festive and creative :) Enjoy your day! 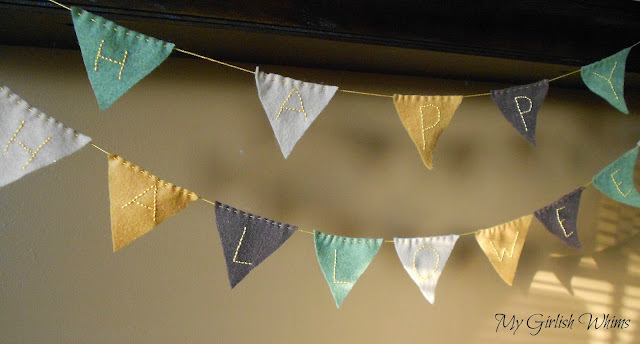 I love penant banners - this is just too cute! Love the vintage frame! Where did you get it from? Saw an interesting article about sprucing up a space for fall and thought it'd be interesting to share (eieihome.com/blog/spice-up-your-space-with-the-newest-textiles-textures-and-patterns-for-fall.html) Enjoy!